This art-deco building once housed a Woolworth's Department Store in the 1940's, today Delaware History Museum uses an overarching theme of "Delaware: One State, Many Stories," to tell the state's history through topics that include Delaware's immigrant history, maritime heritage, agricultural roots, and Wilmington's transformation from industrial hub to financial center. NOT TO MISS: Housed within the Delaware History Museum is the Mitchell Center for African American Heritage. Sharing the museum's theme, the exhibit Journey to Freedom presents compelling perspectives of African Americans’ struggles for human rights, freedom and dignity in Delaware and the nation. The Brandywine Passport is your ticket to exploration within this beautiful corner of Delaware. Discover the rich art, history and culture of the area and appreciate the beauty surrounding its most unique attractions. 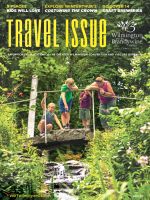 Plan ahead of your visit with a free Wilmington & the Brandywine Valley Visitors Guide.